Medicare comes in four parts not-so-creatively named A, B, C and D.
I use the types as an acronym to sort them in my mind. These are generalizations and, by definition, there is overlap. Remember, do NOT fail to enroll or delay in enrolling or you can get a premium surcharge. 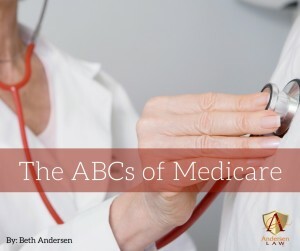 Medicare Part A: Acute care for the ill and infirm. This includes hospital coverage, skilled nursing facility coverage, hospice care, home health care. Mental health services can be included as well. Part A does NOT include a premium but does include a deductible (which is $1,288 in 2016.) For hospital stays, there is coinsurance of $322 per day after a 60-day stay and $644 per day after 90 days. Medicare Part B: Basic care for the basically healthy or ongoing treatment: your primary care provider, out patient services, preventative care, home health care. The deductible is currently $166 and then the participant must pay 20 percent of the Medicare-approved amount. There is also a premium. For most patients, the premium is currently $104.90 monthly. Medicare Part C: Choice enrollment in a private Cooperative plan such as an HMO such as Kaiser. It is also called the Medicare Advantage. Medicare Advantage is really just a different way to get the Medicare coverage. In 2015, 667,277 people in Colorado were on Medicare and 281,467 of them were in Medicare C. You can get additional coverage not covered by A and B in some of the Medicare Advantage plans. Medicare Part D: Drugs, meaning prescription drugs. This became effective in 2006. You can do some informed shopping for Medicare D by going to the Medicare.gov website and plugging in the drugs you use. The website is full of information and will help you find the right plan for you. Plan deductibles cannot exceed $360 in 2016. Have you heard of the Doughnut hole? This is a gap in Medicare D coverage for between the initial coverage limit and the catastrophic coverage limit. When Medicare D was initially enacted, participants had to pay 100 percent of their prescription drugs in this gap. The Affordable Care Act changed this and provides for increasing coverage of the gap each year until the doughnut hole is closed in 2020. Medigap policies are private policies that cover the gaps in coverage such as the deductible and coinsurance requirements of Medicare A and B. Congress has standardized these plans and requires that all Medigap policies conform to standardized formats labeled A through N. This should assist consumers is shopping for Medigap as the policies of each letter are consistent from provider to provider. For example, all Medigap A policies cover Medicare A coinsurance and hospital costs up to 365 days after Medicare benefits are used; Medicare B coinsurance or copayment; up to 3 pints of blood; and Part A hospice care coinsurance or copayment. All Medigap B policies cover these same things and are also Part A deductible.